Migrating your IT to the cloud enables you to move away from the constant cycle of capital investment in servers and storage and to instead consume compute power ,as you require it, from the cloud as-a-service. Codestone Cloud Compute provides an easy and highly flexible way for you to make this step creating your own virtual data centre in our cloud, professionally managed by the Codestone team. Codestone Cloud is a highly secure and resilient virtualised compute environment owned and managed by Codestone, distributed across a number of UK-only based data centres. This environment enables us to create for our customers Virtual Data Centre and Private Cloud environments to meet their specific needs. Codestone Cloud enables you to virtualise your IT environment, even those applications that were not developed for cloud deployment. For your business this provides inherent business continuity with no application dependent on a single physical server or location, which significantly increases resilience. Whether you are looking to migrate existing NTFS based storage such as DAS or NAS to the cloud, create your own private cloud storage platform or leverage public cloud storage, we are able to accommodate this utilising our UK-only data centres. Our UK Network Operation Centre operates 24×7, 365 days a year. We have a team of highly trained technicians that can monitor and maintain your environment for you and deliver IT services tailored to your needs and the reassurance you have access to a team of specialists when you need them. 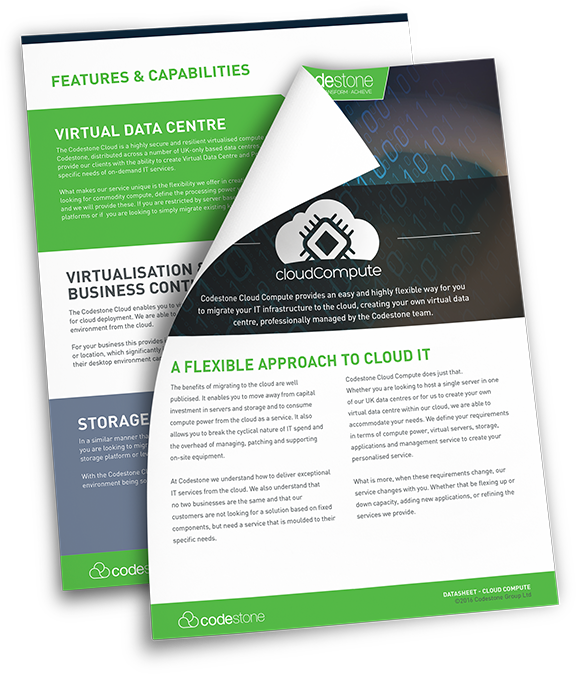 At Codestone we understand how to deliver exceptional IT services from the cloud. We also understand that no two businesses are the same and that our customers are not looking for a solution based on fixed components, but need a service that is moulded to their specific needs. Codestone Cloud Compute does just that. Whether you are looking to host a single server in one of our UK data centres or for us to create your own virtual data centre within our cloud, we are able to accommodate your needs. What is more, when these requirements change, our service changes with you. Whether that be flexing up or down capacity, adding new applications, or refining the services we provide. In the way you deploy and scale your IT environment, consuming IT in incremental steps as you need it. Through inherent resilience and virtualising you IT environment across multiple servers and multiple locations. Removing the need to purchase physical on-premise hardware, but instead consuming IT as an operating expense. Discover more about Codestone Cloud Compute and how we can migrate your IT to the Cloud. Find out more about the capabilities of Codestone Cloud Compute by chatting to one of our experts.